Multiple organ dysfunction syndrome (MODS) is a continuum, with incremental degrees of physiologic derangements in individual organs; it is a process rather than a single event. Alteration in organ function can vary widely from a mild degree of organ dysfunction to completely irreversible organ failure. The degree of organ dysfunction has a major clinical impact. In a classic 1975 editorial by Baue, the concept of “multiple, progressive or sequential systems failure” was formulated as the basis of a new clinical syndrome. Several different terms were proposed thereafter (eg, multiple organ failure, multiple system organ failure, and multiple organ system failure) to describe this evolving clinical syndrome of otherwise unexplained progressive physiologic failure of several interdependent organ systems. Eventually, the term MODS was proposed as a more appropriate description. MODS is defined as a clinical syndrome characterized by the development of progressive and potentially reversible physiologic dysfunction in 2 or more organs or organ systems that is induced by a variety of acute insults, including sepsis. For patient education resources, see the Blood and Lymphatic System Center, as well as Sepsis (Blood Infection). Stages of sepsis based on American College of Chest Physicians/Society of Critical Care Medicine Consensus Panel guidelines. Infection is usually a microbial phenomenon in which an inflammatory response to the presence of microorganisms or the invasion of normally sterile host tissue by these organisms is characteristic. However, viral infections can be indistinguishable from bacteria infections in their presentation. Bacteremia is the presence of viable bacteria in the blood. Sepsis is a systemic response to infection. It is identical to SIRS, except that it must result specifically from infection rather than from any of the noninfectious insults that may also cause SIRS (see the image below). 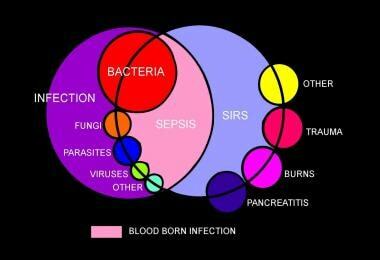 That sepsis and SIRS are phenotypically similar underscores a common inflammatory pathway causing both. In early 2016, the Society of Critical Care Medicine and the European Society of Intensive Care Medicine convened a task force to address definitions and clinical criteria for sepsis. The task force concluded that sepsis should be defined as life-threatening organ dysfunction caused by a dysregulated host response to infection. Organ dysfunction is represented by an increase in the Sequential [sepsis-related] Organ Failure Assessment (SOFA) score  of 2 points or more, which is associated with an in-hospital mortality greater than 10%. Septic shock is defined as a subset of sepsis in which profound circulatory, cellular, and metabolic abnormalities are associated with a greater risk of mortality than with sepsis alone. In out-of-hospital, emergency department, or general hospital ward settings, adult patients with suspected infection can be rapidly identified as being more likely to have poor outcomes typical of sepsis if they have at least two of the following clinical criteria that together constitute a new bedside clinical score termed quick SOFA (qSOFA)  : respiratory rate of 22/min or greater, altered mentation, or systolic blood pressure of 100 mm Hg or less. MODS is the presence of altered organ function in an acutely ill patient such that homeostasis cannot be maintained without intervention. Primary MODS is the direct result of a well-defined insult in which organ dysfunction occurs early and can be directly attributable to the insult itself. Secondary MODS develops as a consequence of a host response and is identified within the context of SIRS. The inflammatory response of the body to toxins and other components of microorganisms causes the clinical manifestations of sepsis. Sepsis has been referred to as a process of malignant intravascular inflammation. Normally, a potent, complex, immunologic cascade ensures a prompt protective response to microorganism invasion in humans. A deficient immunologic defense may allow infection to become established; however, an excessive or poorly regulated response may harm the host through maladaptive release of indigenously generated inflammatory compounds (see the image below). 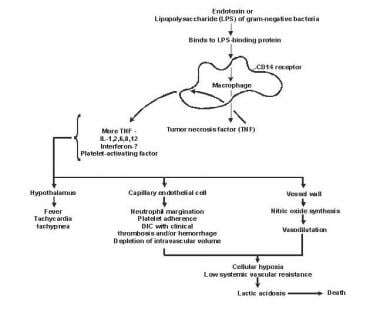 Pathogenesis of sepsis and multiorgan failure. Lipid A and other bacterial products release cytokines and other immune modulators that mediate the clinical manifestations of sepsis. Interleukins, tumor necrosis factor (TNF)-α, interferon gamma (IFN-γ), and other colony-stimulating factors are produced rapidly within minutes or hours after interactions of monocytes and macrophages with lipid A. Inflammatory mediator release becomes a self-stimulating process, and release of other such mediators, including interleukin (IL)-1, platelet activating factor, IL-2, IL-6, IL-8, IL-10, and nitric oxide (NO), further increases cytokine levels. This leads to continued activation of polymorphonuclear leukocytes (PMNs), macrophages, and lymphocytes; proinflammatory mediators recruit more of these cells. All of these processes create a state of destructive immunologic dissonance. Sepsis is described as an autodestructive process that permits extension of the normal pathophysiologic response to infection to involve otherwise normal tissues and results in MODS. Organ dysfunction or organ failure may be the first clinical sign of sepsis, and no organ system is immune from the consequences of the inflammatory excesses of sepsis. Mortality increases as organ failure increases. Although uncontrolled, once MODS develops systemic evidence of both proinflammatory and anti-inflammatory up-regulation are usually present, suggesting that failure of host defense homeostasis is the final pathway from sepsis to MODS, rather than simple hypotension-induced end-organ injury, as may occur with hemorrhagic shock. Survival from severe sepsis with MODS is usually associated with a generalized reduction in both the proinflammatory and anti-inflammatory response. A novel hypothesis has recently emerged that survival from severe sepsis requires a generalized down-regulation of the body’s immune response, energetic functions, and associated organ performance. Thus, MODS may by the host’s adaptive response to overwhelming inflammation, allowing inflammation to clear without causing permanent end-organ harm. As discussed below, all organs reveal a generalized hyporesponsiveness that is clearly abnormal in health but may mark a survival strategy in severe sepsis. Significant derangement in autoregulation of circulation is typical of sepsis. Vasoactive mediators cause vasodilatation and increase microvascular permeability at the site of infection. NO plays a central role in the vasodilatation of septic shock. Also, impaired secretion of vasopressin may occur, which may permit persistence of vasodilatation. Changes in both systolic and diastolic ventricular performance occur in sepsis. Through the use of the Frank-Starling mechanism, cardiac output often is increased to maintain blood pressure in the presence of systemic vasodilatation. Patients with preexisting cardiac disease are unable to increase their cardiac output appropriately. Regionally, sepsis interferes with the normal distribution of systemic blood flow to organ systems. Consequently, core organs may not receive appropriate oxygen delivery, and the result is what is known as regional hypoperfusion. Microcirculation is the key target organ for injury in sepsis since vascular endothelium is universally affected by the circulating inflammatory mediators. Although it is unclear if microcirculatory abnormalities are the cause or an innocent bystander of the end-organ injury, clear microvascular dysfunction is seen. A decrease in the number of perfused capillaries is seen, although with application of vasodilator therapies, full microvascular recruitment occurs. Mitochondrial dysfunction also occurs and is often associated with reduced mitochondrial transmembrane potential gradients, which are necessary to drive oxidative phosphorylation. The end result is an apparent inability of end-organs to extract oxygen maximally. Debate continues as to whether this failure of energy metabolism is an adaptive cytoprotective mechanism similar to hibernation or reflects primary mitochondrial pathology. These are areas of active research but do not presently translate into clear clinical practice guidelines. Increased capillary endothelial permeability leads to widespread protein-rich tissue edema. Septic shock and SIRS are characterized by reversible myocardial depression, which can prove resistant to catecholamine and fluid administration. Circulating “myocardial depressant factor”—probably representing the synergistic effects of TNF-α, IL-1β, other cytokines, and NO—is implicated in pathogenesis. The two characteristics of this acute stress myocardial depression are impaired adrenergic responsiveness and diastolic dysfunction leading to relative catecholamine resistance and small rather than dilated hearts. Macrovascular myocardial ischemia and hypoperfusion are unlikely contributors. In severe sepsis and septic shock, microcirculatory dysfunction and mitochondrial depression cause regional tissue distress, and regional dysoxia therefore persists. This condition is termed microcirculatory and mitochondrial distress syndrome (MMDS). Sepsis-induced inflammatory autoregulatory dysfunction persists, and oxygen need is not matched by supply, leading to MODS. Redistribution of intravascular fluid volume resulting from reduced arterial vascular tone, diminished venous return from venous dilation, and release of myocardial depressant substances causes hypotension. Endothelial injury in the pulmonary vasculature leads to disturbed capillary blood flow and enhanced microvascular permeability, resulting in interstitial and alveolar edema. Neutrophil entrapment within the pulmonary microcirculation initiates and amplifies the injury to alveolar capillary membranes. Acute lung injury and acute respiratory distress syndrome (ARDS) are frequent manifestations of these effects. Indeed, sepsis and pneumonia are the most common causes of ARDS. The gastrointestinal (GI) tract may help propagate the injury of sepsis. Overgrowth of bacteria in the upper GI tract may be aspirated into the lungs, producing nosocomial or aspiration pneumonia. The normal barrier function of the gut may be affected, allowing translocation of bacteria, endotoxins, and normal digestive proteases into the systemic circulation and extending the septic response. Septic shock can cause paralytic ileus that can lead to a delay in the institution of enteral feeding. Excess NO production is thought to be the causative agent of sepsis-induced ileus. The optimal level of nutritional intake is interfered with in the face of high protein and calorie requirements. Narcotics and muscle relaxants can further worsen GI tract motility. As a consequence of the role the liver plays in host defense, the abnormal synthetic functions caused by liver dysfunction can contribute to both the initiation and progression of sepsis. The reticuloendothelial system of the liver acts as a first line of defense in clearing bacteria and their products; liver dysfunction leads to a spillover of these products into systemic circulation. Liver failure (“shocked liver”) can be manifested by elevations in liver enzymes and bilirubin, coagulation defects, and failure to excrete toxins such as ammonia, which lead to worsening encephalopathy. Acute kidney injury (AKI) often accompanies sepsis. Different etiologies for AKI have been reported, and the cause is typically thought to be multifactorial. The mechanism of AKI is complex but likely involves a decrease in effective intravascular volume resulting from systemic hypotension, direct renal vasoconstriction, release of cytokines, and activation of neutrophils by endotoxins and other peptides, which contribute to renal injury. Still, most animal studies show that renal blood flow is increased, not decreased, in sepsis, though associated with impaired tubular function and a lack of significant histologic evidence of tubular injury. Involvement of the central nervous system (CNS) in sepsis produces encephalopathy and peripheral neuropathy. The pathogenesis is poorly defined but is probably related to systemic hypotension, which can lead to brain hypoperfusion. The precise mechanisms of cell injury and resulting organ dysfunction in sepsis are not fully understood. MODS is associated with widespread endothelial and parenchymal cell injury, some of which can be explained by the following 4 proposed mechanisms. The septic circulatory lesion disrupts tissue oxygenation, alters the metabolic regulation of tissue oxygen delivery, and contributes to organ dysfunction. Microvascular and endothelial abnormalities contribute to the septic microcirculatory defect in sepsis. The reactive oxygen species, lytic enzymes, and vasoactive substances (eg, NO and endothelial growth factors) lead to microcirculatory injury, which is compounded by the inability of the erythrocytes to navigate the septic microcirculation. Endotoxin, TNF-α, and NO may cause damage to mitochondrial electron transport, leading to disordered energy metabolism. This is called cytopathic or histotoxic anoxia, an inability to utilize oxygen even when it is present. Apoptosis (programmed cell death) is the principal mechanism by which dysfunctional cells are normally eliminated. The proinflammatory cytokines may delay apoptosis in activated macrophages and neutrophils, but other tissues (eg, gut epithelium), may undergo accelerated apoptosis. Therefore, derangement of apoptosis plays a critical role in the tissue injury of sepsis. The interaction between proinflammatory and anti-inflammatory mediators may lead to an imbalance between them. An inflammatory reaction or an immunodeficiency may predominate, or both may be present. Clinical characteristics that relate to the severity of sepsis include the host response to infection, the site and type of infection, the timing and type of antimicrobial therapy, the offending organism, the development of shock, the underlying disease, the patient’s long-term health condition, and the number of failed organs. Factors that lead to sepsis and septic shock may not be essential in determining the ultimate outcome. Estimating the exact incidence of sepsis throughout the world is difficult. Studies vary in their methods of determining the incidence of sepsis. [#IntroductionFrequencyUnitedStates]Current estimates suggest that the incidence of sepsis is greater than 500,000 cases per year. Reported prevalence rates for SIRS of sepsis range from 20% to 60%. A French study found that severe sepsis was present in 6.3% of all admissions to the intensive care unit (ICU). These figures may be usefully compared with those reported by Martin et al  and by Blanco et al. Approximately 40% of patients with sepsis may develop septic shock. Patients who are at risk include those with positive blood cultures. Mortality from MODS remains high. Mortality from ARDS alone is 40-50%; once additional organ system dysfunction occurs, mortality increases as much as 90%. Several clinical trials have demonstrated a mortality ranging from 40% to 75% in patients with MODS arising from sepsis. The poor prognostic factors are advanced age, infection with a resistant organism, impaired host immune status, and poor prior functional status. Development of sequential organ failure despite adequate supportive measures and antimicrobial therapy is a harbinger of a poor outcome. A multicenter prospective study published in the Journal of the American Medical Association reported a mortality of 56% during ICU stay. Of all deaths, 27% occurred within 2 days of the onset of severe sepsis, and 77% of all deaths occurred within the first 14 days. The risk factors for early mortality in this study were a higher severity of illness score, the presence of 2 or more acute organ failures at the time of sepsis, shock, and a low blood pH (< 7.3). Baue AE. Multiple, progressive, or sequential systems failure. A syndrome of the 1970s. Arch Surg. 1975 Jul. 110(7):779-81. [Medline]. Gustot T. Multiple organ failure in sepsis: prognosis and role of systemic inflammatory response. Curr Opin Crit Care. 2011 Apr. 17(2):153-9. [Medline]. Bone RC, Balk RA, Cerra FB, et al. Definitions for sepsis and organ failure and guidelines for the use of innovative therapies in sepsis. The ACCP/SCCM Consensus Conference Committee. American College of Chest Physicians/Society of Critical Care Medicine. 1992. Chest. 2009 Nov. 136(5 Suppl):e28. [Medline]. Singer M, Deutschman CS, Seymour CW, Shankar-Hari M, Annane D, Bauer M, et al. 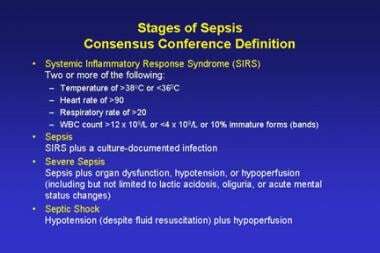 The Third International Consensus Definitions for Sepsis and Septic Shock (Sepsis-3). JAMA. 2016 Feb 23. 315 (8):801-10. [Medline]. Vincent JL, Moreno R, Takala J, Willatts S, De Mendonça A, Bruining H, et al. The SOFA (Sepsis-related Organ Failure Assessment) score to describe organ dysfunction/failure. On behalf of the Working Group on Sepsis-Related Problems of the European Society of Intensive Care Medicine. Intensive Care Med. 1996 Jul. 22 (7):707-10. [Medline]. Seymour CW, Liu VX, Iwashyna TJ, Brunkhorst FM, Rea TD, Scherag A, et al. Assessment of Clinical Criteria for Sepsis: For the Third International Consensus Definitions for Sepsis and Septic Shock (Sepsis-3). JAMA. 2016 Feb 23. 315 (8):762-74. [Medline]. Harrois A, Huet O, Duranteau J. Alterations of mitochondrial function in sepsis and critical illness. Curr Opin Anaesthesiol. 2009 Apr. 22(2):143-9. [Medline]. Uchino S, Kellum JA, Bellomo R, Doig GS, Morimatsu H, Morgera S. Acute renal failure in critically ill patients: a multinational, multicenter study. JAMA. 2005 Aug 17. 294(7):813-8. [Medline]. Ruf W. New players in the sepsis-protective activated protein C pathway. J Clin Invest. 2010 Sep. 120(9):3084-7. [Medline]. Angus DC, van der Poll T. Severe sepsis and septic shock. N Engl J Med. 2013 Aug 29. 369(9):840-51. [Medline]. Adrie C, Alberti C, Chaix-Couturier C, Azoulay E, De Lassence A, Cohen Y. Epidemiology and economic evaluation of severe sepsis in France: age, severity, infection site, and place of acquisition (community, hospital, or intensive care unit) as determinants of workload and cost. J Crit Care. 2005 Mar. 20(1):46-58. [Medline]. Brun-Buisson C, Doyon F, Carlet J. Bacteremia and severe sepsis in adults: a multicenter prospective survey in ICUs and wards of 24 hospitals. French Bacteremia-Sepsis Study Group. Am J Respir Crit Care Med. 1996 Sep. 154(3 Pt 1):617-24. [Medline]. Martin CM, Priestap F, Fisher H, et al. A prospective, observational registry of patients with severe sepsis: the Canadian Sepsis Treatment and Response Registry. Crit Care Med. 2009 Jan. 37(1):81-8. [Medline]. Blanco J, Muriel-Bombín A, Sagredo V, et al. Incidence, organ dysfunction and mortality in severe sepsis: a Spanish multicentre study. Crit Care. 2008. 12(6):R158. [Medline]. [Full Text]. Brun-Buisson C. The epidemiology of the systemic inflammatory response. Intensive Care Med. 2000. 26 Suppl 1:S64-74. [Medline]. Brun-Buisson C, Doyon F, Carlet J, Dellamonica P, Gouin F, Lepoutre A, et al. Incidence, risk factors, and outcome of severe sepsis and septic shock in adults. A multicenter prospective study in intensive care units. French ICU Group for Severe Sepsis. JAMA. 1995 Sep 27. 274(12):968-74. [Medline]. Lobo SM, Rezende E, Knibel MF, et al. Early determinants of death due to multiple organ failure after noncardiac surgery in high-risk patients. Anesth Analg. 2011 Apr. 112(4):877-83. [Medline]. Shapiro NI, Trzeciak S, Hollander JE, et al. A prospective, multicenter derivation of a biomarker panel to assess risk of organ dysfunction, shock, and death in emergency department patients with suspected sepsis. Crit Care Med. 2009 Jan. 37(1):96-104. [Medline]. Nelson DP, Lemaster TH, Plost GN, Zahner ML. Recognizing sepsis in the adult patient. Am J Nurs. 2009 Mar. 109(3):40-5; quiz 46. [Medline]. Dellinger RP, Levy MM, Rhodes A, Annane D, Gerlach H, Opal SM. Surviving sepsis campaign: international guidelines for management of severe sepsis and septic shock: 2012. Crit Care Med. 2013 Feb. 41(2):580-637. [Medline]. De Backer D, Biston P, Devriendt J, et al. Comparison of dopamine and norepinephrine in the treatment of shock. N Engl J Med. 2010 Mar 4. 362(9):779-89. [Medline]. Patel GP, Grahe JS, Sperry M, et al. Efficacy and safety of dopamine versus norepinephrine in the management of septic shock. Shock. 2010 Apr. 33(4):375-80. [Medline]. Khanna A, English SW, Wang XS, et al. Angiotensin II for the Treatment of Vasodilatory Shock. N Engl J Med. 2017 Aug 3. 377 (5):419-430. [Medline]. Angus DC. Drotrecogin alfa (activated) ... a sad final fizzle to a roller-coaster party. Crit Care. 2012 Feb 6. 16(1):107. [Medline]. Briegel J, Forst H, Haller M, et al. Stress doses of hydrocortisone reverse hyperdynamic septic shock: a prospective, randomized, double-blind, single-center study. Crit Care Med. 1999 Apr. 27(4):723-32. [Medline]. Annane D, Renault A, Brun-Buisson C, et al. Hydrocortisone plus Fludrocortisone for Adults with Septic Shock. N Engl J Med. 2018 Mar 1. 378 (9):809-818. [Medline]. Prescott HC, Angus DC. Enhancing Recovery From Sepsis: A Review. JAMA. 2018 Jan 2. 319 (1):62-75. [Medline]. Nathens AB, Marshall JC. Selective decontamination of the digestive tract in surgical patients: a systematic review of the evidence. Arch Surg. 1999 Feb. 134(2):170-6. [Medline]. Acute respiratory distress syndrome (ARDS) present in this chest x-ray (CXR) film is a common organ system affected in multiorgan failure of sepsis. Acute respiratory distress syndrome (ARDS) shown in this chest x-ray (CXR) film is a common complication of septic shock. Note bilateral airspace infiltration, absence of cardiomegaly, vascular redistribution, and Kerley B lines. Organizing phase of diffuse alveolar damage (ARDS) secondary to septic shock shows diffuse alveolar injury and infiltration with inflammatory cells. Organizing diffuse alveolar damage in a different location showing disorganization of pulmonary architecture. A high-power view of organizing diffuse alveolar damage (ARDS) shows hyperplasia of type II pneumocytes and hyaline membrane deposits. aPTT = activated partial thromboplastin time; ARDS = acute respiratory distress syndrome; CNS = central nervous system; DIC = disseminated intravascular coagulation; FI O2 = fraction of inspired oxygen; PEEP = positive end-expiratory pressure; PT = prothrombin time.